It seems ironic that “beautify” is the word on which I am meditating today. It has not been a “beautiful” kind of day. It has been a busy day, a challenging day, an ordinary day where the stresses and strains of human life are evident. Then. I recalled that the word was “beautify” not “beautiful.” There is a difference. Beautify is an intention…bringing beauty in to a place or experience. It’s a simple but transformative action: bringing an element of beauty to the ordinary. I began to see the day differently. It started with a ritual at my daughter’s school. The incoming class makes squares for a quilt; the quilt is presented to the school at Winter Ceremony. Each year, the community of parents, teachers, and friends are invited to add stitches to the quilt and blend words of love and encouragement into the fabric. 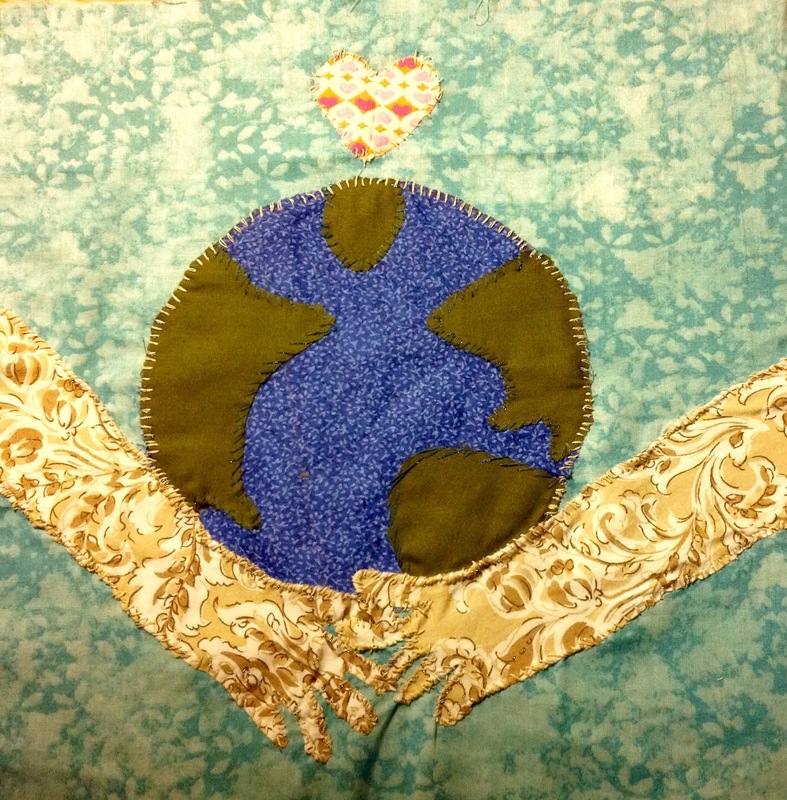 That morning began by embroidering the word, “peace” onto the community quilt, next to my daughter’s quilt square of hands holding the world. I was one of many stitches beautifying the fabric, each person making her or his own contribution to the whole. Then, I served at food pantry. It was an unbelievably busy day at the pantry. Admittedly, it was a hard day where we ran low on food. The crowd was tense at times, the volunteers were exhausted. Then, there were moments of intentional beauty: parents from the day school that had donated unbelievable amounts of toys, clothes, coats that we could offer to those waiting. A man who was checking in at the beginning and saw a woman come in late with a look of worry on her face; he waved her over and gave her his place in line saying, “I can wait until next week…take my place.” She cried and called it a miracle. Another woman who had been served the week before came in and received a gentle and kind reminder of the USDA “once a month” rule. Instead of disappointment or leaving she asked, “can I stay and volunteer?” To which we said, “of course!” We needed her and she brought light and hope to beautify that space with her optimism. After pantry, some of us exchanged reflections on the day. We shared highs and lows and words of support. We each had seen different beauty emerging even in the challenges of the day. Grace and abundance were revealed, story by story and person by person. I realize tonight that with intention, beauty was all around us and abiding with us throughout this day. People chose to allow it in, time after time. The intention to bring the beauty of art, nature, human kindness, gentleness, giving, service, compassion into the fabric of life is like those stitches on the quilt square. Stitch by stitch, the ordinary is transformed. Blessed are those who show up; they beautify the world. This entry was posted in Advent 2014 and tagged Advent, beautify, caring, community, compassion, encouragement, human nature, intention, mart, metaphor, quilt, quilting, service. Bookmark the permalink.